If you’re experiencing pain in your shoulder, you might be wondering how to tell if you tore your rotator cuff. Keep reading to learn more about the symptoms of rotator cuff tears and when to see a medical professional for evaluation. If you suspect you have a torn rotator cuff, you should see a medical professional as soon as possible. However, there are a few tests you can do at home before your visit that could give you an indication of whether or not your rotator cuff is damaged. Stand in front of a mirror and slowly raise your arms in front of your body. If it is painful or you cannot raise your arms above shoulder height, your rotator cuff could be torn, and you should see a healthcare provider immediately. Stand in front of a mirror and slowly raise your arms to the side. Just like with the first test, if it is painful or you cannot raise your arms above shoulder height, you should see a medical professional immediately. While standing in front of your mirror, raise your arms with your elbows making a V shape. Your hands should be slightly above your shoulders. Next, make a thumbs up with your hand, and slowly point your thumbs inward toward the ground. Then, lower your arms, and return to your starting position. If you can do this without pain, your rotator cuff might not be torn. Stand in front of a friend and hold your arms out in front of you. Have the friend gently push down on your arms while you try to resist. No pain could be a sign that your rotator cuff isn’t torn. If you’ve recently been injured and are experiencing pain and loss of motion, you should seek medical treatment right away to prevent further damage. 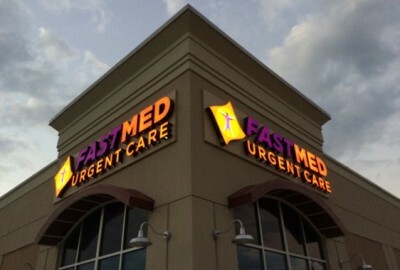 And because injuries don’t always happen between the hours of 9 a.m. and 5 p.m., FastMed Urgent Care is open 7 days a week with extended hours and on-site x-rays, making it easy for you to receive the care you need at any time. Find a location near you today and experience our compassionate and fast care.